Health and Wellbeing Goals, GDPR and the best network group ever! Our Members know how to network! So much learning, sharing, help and support on offer - its no wonder after 8 years people still keep coming back month after month! Our seminar captivated and inspired our attendees to pursue better health outcomes - sustainable and honestly and realistically. And our after lunch speaker Clare Brook gave an insightful and critical GDPR update - now reality has hit home. So come on - why not join us next time on 25th April and see what you have been missing? Networking love - Cupid strikes again! January Kick off event - Learning, helping and fabulous Networking! What an event - Great Businesses out in their droves! Fabulous helpful and critical seminar about Health and Safety needs for Businesses, and our perfect blend of open and networking followed by Strategically planned table networking. What you missed it? Come on - this is the year we all need to up the ante on Networking - with Quality, with Purpose and with ethics at mind! That said - its still only half way through January - bags of Time between now and our 14th February event at The Chester Grosvenor! Come and set some heart to your Networking! WOWZERS! What a firecracker of an event! Top Tips at our seminar by The Cheshire Garden, amazing growth update from Recipro, Para-olympic champions and all captured by our founder member Richard Knew to update our Blog and social media videos! This group just is the best! So many testimonials, and words of support and encouragement - and exceptional talent! We are blessed - and scary to think we are now already gearing up for our festive event on 13th December - it does not seem a year since the last one! As usual treats and surprises in store! Post GDPR many companies were thinking - how can I now keep on connecting with prospects and leads? Well Our Members DDL shone their spotlight on what can still be done - and trust me - all is far from lost! Then that perfect mix of open and strategically planned networking at tables - no competition, unique and diverse businesses all waiting to help, listen learn and grow together. Next month we have a master class in garden design and how to win that all important medal at the big flower shows - so why not join us? Super September event - sculpture, success and splendid connections! WOW! it was just like first day at school - summer in the past and down to serious work! Great connections made and fantastic learning's from our amazing sculptor Simon O'Rourke - with his speed/live carve interwoven with tales of how to build a creative Business following your passion! Then as always perfect blend of relaxed open networking and strategic connections at our tables - we leaven nothing to chance at our events. So - is it time to put more science into your networking? Come join us on October 11th to see what you have been missing! Then as usual our prefect blend of open and structured networking - making new connections, creating opportunities, and importantly helping each other - No Hard Sell here! So come on - 13th Sept - join us - you cant afford to miss it again! Playing the Stock market - but leaving nothing to chance! Fabulous future focussed seminar - helping our members and guests look far far far into the future - to consider how not only how our jobs and Businesses will need to change - but also how that world of work may look for our Children! Next as always, we welcomed over 80 guests to listen, learn, laugh and connect - always with Business based on trust at the fore! So - come on - what are you waiting for? Next event is 14th June at The Double Tree by Hilton - lets do it and book! WOWZERS! love this group. Brilliant - just brilliant and massive value add seminar lead by Denis from Rowlinsons - attendees also benefiting from free MOT of their legal position - just WOW! Then - perfect blend of relaxed informal networking before us as Business Cupids used our member intel to create perfect blend of people at tables. Cant wait to do it again - 17th May at The Grosvenor - where this time - the art of recruiting like minded people - or outsourcing is the challenge we unpick at the seminar! Great event - helped us understand the intricacies of property surveys with DEE SURVEYS - and how with their expertise they can help leese holders and people with property challenges! Then as always a delightful mix of open and strategic networking - blending, and extending networks, deepening and enhancing relationships, and ensuring we all had a helping mindset to help move everyone forward! We were splendid in our green finery this month as we #gogreen for CLATTERBRIDGE Cancer Charity. Connecting and collaborating to create opportunities and do business based on sound ethics and trust. What's NOT to love about this group! Join us 22nd March and experience the magic for yourself! Super event - learning, sharing, collaborating and out of comfort zone - everything you need to wake up to 2018! Super seminar helped us get our ducks in a row and stop burying our head in the sand when it comes to pensions, Wills and LPA. Lead by dream team Carla Brown of Oakmere Wealth Management and Louise Holmes of Oliver and Co - it was jam packed with great advice. Then perfect blend of relaxed yet purposeful networking, strategic table seating plans and delightful company made it an event not to miss! After enjoying out 2 course lunch we were all reminded that we have nothing without our health - so - until next time - 15th February at The Chester Grosvenor - go on - why not join us? Christmas comes early to Chester! WOW! What an event - such generosity and kindness from our members AND guests raising over £1000 for our member charities. Such merriment and excitement at our festive quiz - and such a surprise to see so many Christmas outfits on show! So - don't be dismayed you missed it! Come and join us in January on the 18th for a truly ezxciting and productive start to the year! By George! Thats a wrap! Fabulous info packed seminar lead by Ceri George today - sharing her 20 years of marketing insights and wisdom! Then - the usual firecracker blend of relaxed open networking with strategic table planning - ensured connections were made, deepened, reignited and collaborations and helping mind-set aplenty! Join us in December and seal off your 2017 with a bang! Get your GDPR Business ready! Fabulous informative and problem solving seminar lead by the team from Pro Networks! They presented, listened and dissolved our IT woes in the space of an hour! Then - that perfect mix of random networking and structured, purposeful planned strategic table networking - over a brilliant lunch. 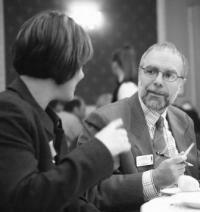 Time to listen, learn, share and help - that's what makes The Business Network Network work! Come on - stop stalling and start progressing - join us on November 9th at The Double Tree - and shape up your marketing for 2018 with Ceri George of By George Marketing! September starts with a masterclass! Brilliant seminar this month with Victoria Lee of The Moment - sharing her top tips for top photos with SLR or your phone - perfect for those blog posts and social media. As always then followed the perfect blend of open networking and strategic table networking - its so wonderful each month to connect amazing Businesses in such a fabulous environment. So - fancy quality networking with the Best Businesses in Chester and Cheshire - then join us October 12th At The Grosvenor! Communicatio that sticks - and connections that grow and grow! Great seminar lead by Ultimate to help our members and guests improve the quality and impact of their communications. Then - usual fabulous mix of open networking with strategic networking at tables - its truly like planning a wedding every month - ensuring the right blend of people - and cupids arrow at work - for BUSINESS of course! Join us WEDNESDAY 13th Sept at The Chester Grosvenor for our next event after a well earned break with the family! Connection Power Hour Rocks - Yet again! Great Connections, collaborations and helping mind-set is what sets us apart! Yet again we challenged around 90 of our members and guests to get strategic about who they wanted to meet - and leveraged the power of the network to make those connections happen. Great networking, listening and sharing of "little black books" meant that everyone was able to help, to benefit to make the world a smaller and more productive place. So -ready to supercharge your network? Don't hide away in August thinking everyone is away on holiday - come and join us and supercharge your network! June - Lego, learning and Outsourcing! Join us 6th July at The newly renovated and extended Double Tree - we cant wait to see what they have in store for us! May sees up celebrating people, learning and racing! Great group, fantastic food, and an eclectic mix of people makes for a collaborative and connected group! Come on - join us June 8th and see what you have been missing! March means its Budget time! Our members were out in force - on the day of the Budget! The Budget may have been Work in Progress whilst we were networking - but that did not deter our members and guests. Andy Lewis of Voyage Marketing lead us on a whistle stop tour of what it takes to strategically market. Then our prefect blend of structured and strategic networking meant there were opportunities to share, learn, help, connect and collaborate. As we look to Aprils event - We know we can't control the budget - but we can choose our response - and to help us with that Michelle Anthony from Morris and Co will bring to life what the budget means and answer questions at our April 6th event. So come on - time to join us? February feels lovely - lots of fab connections! Business cupid at work! Lots of fabulous connections made at our event this week. What was not to love? Great food, brilliant company and learning, sharing, giving and helping mindset - and yes - we all wore green to support Clatterbridge and their "Go Green" fundraiser! January means 1 thing - strategic plans, and knowing who we want to meet! November means growth, franchising and opportunities! Fabulous event - brilliant learnings for our seminar attendees ambitious for growth through floating or franchising. Our usual - fun filled, relaxed yet highly structured an purposeful event lead us to make new connections, deepen relationships and learn. October and we go Mad for Tonic! Tonic? Yes - with the resurgence of Gin our resident Wine expert Peter from Wine Mad took us on a sensory adventure to understand why tonic is as important as the Gin! As always then - we welcomed around 90 members and visitors to our main event - perfect blend of relaxed mingling over reception drinks followed by purposeful and strategic networking at our perfectly planned tables! So - come on - why not join us in November and see what we are all about? September sees us all "Appy"
Sell out seminar from Appitized, around 100 in attendance - whats not to love? Fab-u-lous event today at The Double Tree - great group, great seminar topic - great tables and perfect networking from the best network in Chester. So many great connections and opportunities to flourish, to connect, to collaborate and to take time to focus on your business. So - see you next month? 13th October at The Macdonald Craxton Wood Hotel! It may be Summer - but we still rock at networking! Great group today - yes - lots of members away taking well earned breaks - but around 70 who still like to connect, communicate, collaborate - even when the sun is shining! Fabulous seminar lead by Cath Harrison, founder and MD of rapidly growing and successful JVP Group - sharing her up to the minute advice on how to recruit and retail talent - without breaking the bank! Then - the perfect blend of free networking following by 90 minutes of strategic, planned tables - no competitors, new contacts, and renewed friendships - the perfect mix of discover and reconnection. So - see you on the 15th Sept at the Double Tree shall we??? Joyous July - brings 100 flocking to our event! Then as usual our perfect blend of freedom to mingle with highly structured strategic networking at our perfectly planned tables. So - we look to August - and hopefully sun! Join us on 11th August at The Double Tree for lots of brilliant connection, conversations and collaborations! Jubilent June is a kicking event! Euro Champs or Quality Networking.... mmmm lets do both! In spite our end time dovetailing to the start of England Wales match- we welcomed almost 80 businesses to our June event. As we now move into our 7th year we cannot believe the vibrance, vigour and va va boom go getting nature of our members - many of them still with us after 7 years! So - another month - another meeting you have missed - so come on - find out what keeps making our members come back year after year after year after year after year after year - and join us 14th July at The Chester Grosvenor! Double Tree - Double Fun - Double delight! Fantastic future focussed seminar lead by Nick from Yonda - and our blend of open and strategic networking left our attendees filled with enthusiasm and opportunities! Well - yet another fabulous event - and the sun shone on us at the lovely Double Tree by Hilton! The seminar attendees were amazed with the future focussed opportunities that mobile and vertical videography can provide to the future of business! Then as usual - the perfect blend of open networking and time at tables meant that we had lots of opportunities to learn, listen and help each other! So - ready for the next one? We celebrate going into our 7th year of events - and yes we still retain over 60% of our founder members and are the quality network in Chester! So - come of celebrate with us - at The Chester Grosvenor - 16th June = call, email or simply book! April 's event was quite awe inspiring! Great seminar, awe inspiring venue at The Grosvenor and - well whats not to love when you have around 100 of Chester and Cheshire's finest Business brains and hearts in the room! So many thank yous' good news stories and effort from members to support local charities - THIS is the network that gives - never takes! They make me so proud - it is an honour to work with the year in year out - so until may 19th when we will be blown away with how "Drones" will be the next technical revolution (for good of course) - see you in 4 weeks! The Business Network and the 10'o clock news! Well that was an event with a difference! The BBC decided WE would be the network to consult on the forthcoming BREXIT choice - so after setting off our intrepid pair from Partnership Design - we then snook the BBC in to foil them in action - NO PRESSURE! Then we squeezed in a 30 minute round table with Laura Kuenssberg of the BBC and a non member, which made it to the 6pm and 10pm news! It was interesting seeking views from members, the majority of which were clearly "pro stay in" ... so the polls will be interesting to watch! All that and fantastic service from Craxton Wood again and a wonderful set of connection made! Business love hits the air again! Love was sooooooo in the air today! From the learnings at the seminar lead by Andy Wooles - Devils advocate for all things web related to the heady mix of members and new attendees - and a flock of new and renewing members - some for their 6th year! Great energy again, determination to help - and No HARd SELL - thats what makes the Business Network Chester (Probably) the best network in the City! Come join us in March to see what you have been missing! January kicks off with a bang! Fantastic energy in the room at The Double Tree - what a brilliant event - and the feedback was just so sublime! We love our events -- the reason why? You can see our attendees walk out 2 inches higher, 2 stones lighter - sharing such an uplifting and positive time with successful people if great for the soul. Filled with Va Va Voom and renewed energy for 2016 - they flocked out to exciting new opportunities, collaborations and exciting opportunities ahead. Dec the Halls - what a brilliant event! Fantastic event - full of generosity, giving and good fun to get us into the festive spirit. We raised almost £1000 for our member charities and the generous donations of "time, talent and treasure" made for an exceptional day! To join us and kick start your 2016 - come along to the event on 14th january 2016 at The Double Tree! November never fails to impress! Fabulous event at The Grosvenor - and even though we had to switch the date we still welcomed almost 100 to the event. Fabulous and very week attended seminar lead by BHH Progress saw visitors and members learn the power of DISC styles - and by knowing and adapting our own style to match and mirror others - we learnt about the benefits they bring. Then our perfect blend of open networking and strategic table planning meant there were new connection to be made by all. Christmas treasures await for our December 10th event - see you there! Great to be back at The Double Tree - October Rocks again! Sooo - tired of meeting the same faces, or want to meet the people on your target list? Want to find a supplier who you can be assured you can trust? Then why not come and try our next event? We next meet on WEDNESDAY 11th November at The Chester Grosvenor and we would love to see you there with all our members and other guests! To book - you know what to do - click "book", call Tracy on 0844 310 1400 or simply email Tracy@Business-network.co.uk to secure your place! September event - new contacts - new venue - new learnings! Everything was new this month - just like a start of a new term at school! We work hard to attract new people to each event and had a broad cross section of Businesses attending - from £100M turnover companies to niche businesses working with balloons and horses! Great mindset to connect, communicate and collaborate as well. Join us in October on the 15th to learn about how we are the most trusted and quality network in Chester! July keeps it just pitch perfect! Ready to learn, to share, to connect and help! All the hall marks of our members who delighted us with tails of good deeds, good business and good times. Claire House hosted our seminar and shared their insights on how doing good, does good for your Business. Then with almost 80 in attendance, we networked, listened and helped each other - and celebrated some fantastic Business success stories. So - we now look to our "Mega event" on 6th August with our Warrington members - see you there! June has us in the Money! Great seminar and after lunch experience with Simon Yates of Enlightened Money and Olivia Stefanino. Our members learnt about how their money type influences their decision to save, to spend - and squander! Packed with diverse and positive members and guests, we connected, listened and helped each other through the course of the event. See you 16th July at The Grosvenor! May makes us Marketing Gurus! Fab-u-lous seminar By Julie Webb of Azzure Marketing helped us all learn how we can be more consumer minded in marketing our Businesses. Then with the usual diverse mix of members and guests we connected, communicated, listened and learned - and most importantly - celebrated Businesses referred, challenges completed and fantastic funds raised for all our Member charities. Come join us on 18th June for our 6th Birthday - with our founder members many still in attendance at our event! April event - Springing into new opportunities! Fabulous event in April - great connections, great stories and great energy as Summer now speeds towards us! There was definitely a spiny in our guests steps as they joined us for our April event at The Double Tree. Tracy lead the day, with a timely and action packed seminar - reminding everyone how to get - and give - the most from their networking efforts. Then with around 80 in attendance we networked, met, reconnected, laughed, learned and shared invaluable time with each other. To join us again - May 21st is the date! We have been so busy blogging we did not realise it had been so long since we posted news! Its been a really busy Winter period, with our Joint event with Warrington seeing over 120 in attendance, and fantastic seminars from Caulmert and Andy Wooles, its been a busy time! The coming months see seminars to help you develop your marketing strategy, your Lifestyle financial plans amongst others - as well as a refresh on how to get the most - and give the most - to your networking efforts. So... not tried us yet? Why not come and see why 100 or so other local Businesses love what we do for them! October and we go Orange again for Orangutans! October saw our 2nd Orange Fest to support Chester Zoo's appeal "Go orange for orang-utans!" Splendidly bright ties, shirts, dresses and skirts were on display at The Business network Chester did us proud! Of course - we were also there to network with purpose and quality in mind - and with almost 90 in attendance we saw great connection, and heard of long standing collaborations coming to fruition! Join us in November - 13th at The Grosvenor for another quality event! Almost 100 for our Sept event - with Fotofire on fire for our seminar and the CH1 BID in full swing! Great quality connections, collaborations and conversation at our September event. Apparently I was a little giddier than normal - but you know why? Because its hard to contain the energy and passion we have for you our members and guests! We are Going ORANGE for Orangutang's for Chester Zoo in October - 15th (WEDNESDAY) at The Double Tree - go on - dig out the orange dress, orange tie and go orange too! August arrives and networks harmonise! Come and join us - you would be very welcome at our next September networking event, at The Chester Grosvenor and Spa! Over 80 for our July event - diversity ruled as we welcomed unmanned videography, to property developers, to large country estates with grand visions for sustainability. The connections were hot at our event at The Grosvenor. We helped connect Roof and floor trusses to Plumbers, Psychometric profiling for teenagers with schools, and facility management companies with distribution experts! And that was just in the open mingling section! Guests said "its brilliant", "can't believe the quality" "it's a no brainer" and "can I join"... so ill you join us on the 7th August? 4 years young and still vibrant, energetic and full of potential! Brilliant birthday bash saw us celebrate our 4th Birthday. With a splendid seminar lead by BHH progress, and almost 100 in attendance - It was simply a great event. Connections galore, testimonials aplenty - we just had the best time! So to network with purpose, fun and with NO hard sell - why not try us out? There was magic in the air in May - connections, links, charitable successes, and a real vibrancy in the room. Lead by Andy Wooles of WSI, our seminar attendees learnt about the ever changing world that is Google! We then welcomed almost 100 attendees to our event at The Double Tree - with Connections aplenty, we were able to introduce, help, support and "gee" up everyone with our mix of high energy, fun yet purposeful networking. In fact - Its time we called it net-enjoying I think! Join us for our 4th birthday at The Chester Grosvenor and Spa on June 19th - our 4th Birthday! April sees us spring into network city! WOW! it never ceases to amaze us how when you take the time to get to know people well - the connections links and parallels that can be discovered. A great seminar from the Engage Web team myth busted all there is to myth bust about twitter! We then welcomed over 70 local business leaders and organisations to the event. Connections, testimonials, thanks and an amazing video that fantastically brought to life the positive impact our member Elaine Cleland is having on the life chances, focus and determination of children aged 14-18 with their unique and brilliant tool to help young adults tap into their true talents, strengths and passions. Come join us for our May 15th event to see, hear and feel what we are all about. March event - marvelous meeting-marvelous connections! With a great seminar to kick us off, we then welcomed almost 100 quality local businesses to the event. We learnt how the Business community can get behind the CH1 business district bid, and how it would benefit the city and local Businesses. Connection, community, communication, collaboration - what more can we ask for from a network group? Lots of Business Love in the air! We played Business Cupids at our February event. There were some beautiful connections to be shared at our February event - lots of renewals and new members joined us also! The vibe was electric - and we can't wait to do it all again in March at The Chester Grosvenor and Spa once more - March 13th - it will be lucky for our attendees! Tip Top mega Meet event! Brilliant event for our 2 groups to come together - great energy and buzz in the room! When our Chester and Warrington groups come together - wow what an event! Our seminar presenters took attendees on a trip to the future "Beyond the Horizon" to share what the world of digital mobile holds for us all. Then with almost 120 booked, we seated brilliant businesses purposefully and strategically so that they could make great new contacts for 2014. Les Owens of The Trustland Group and Recipro shared his companies history and exciting future with the waste busting, community supporting "Recipro". So we do it all again on Feb 12th - so why not join us - we will be tackling the challenge writing great copy - from the 140 characters of twitter to blog posts to web content - Claire Parker form Good Word PR will show us the way! December - charity at heart - fun and frolics to see off the year! Wine, charitable giving, fun and excellent connections - what more do you need? Great event to send off 2013! Wonderful seminar by Peter Minshull of Clear Black Wine then purposeful networking at the Wonderful Chester Grosvenor and Spa. To join us in the new year - book quickly - it will be our Mega Meet! October, November - the events get better and better! The feedback was brilliant as usual for our recent events. October saw our seminar attendees learn the vital steps they can take to protect and care for elderly loved ones. Sarah Green of the Bunbury Care agency did a great job bringing proactive care to life! In November, we learnt the essence of good copy, and how it creates optimum SEO and web pages - as well as create lots of noise - but positive noise at that from the team at Outwrite PR lead by Tracy North. To join us at our festive December 12th event - and enjoy some fabulous festive insights about wine, cocktails and local beers come and join us for the seminar also being lead by Peter Minshull of Clear Black Wine. Our seminar presenters Perris-Myatt kicked off our fabulous event by sharing their depth of knowledge in an engaging and interactive seminar. Lunch with over 70 companies was bubbling with energy, testimonials and thanks aplenty! Super connections and high energy again at our event, meant that we welcomed over 70 leaders to our event - to connect, to collaborate and share ideas. As usual we were well looked after by The Chester Grosvenor and Spa and the feedback was really positive. Between now and the next event on 17th October there will be lots of 1 2 1's and deepening of connections to be made. Why not join us and find out why over 85% of our founder members choose to renew for their 4th year? 2 groups - 1 philosophy - beautiful connections! Would it work? bringing 2 groups together for lunch? well judging by the show of hands the answer was a resounding yes. So full steam ahead planning our next joint event in January and looking forward to our next event in Chester on 19th at The wonderful Chester Grosvenor and Spa! July's event brings a warm feeling! With members guests keen as usual to learn, connect and help each other we had a vibrant, purposeful meeting once again. Our seminar presenter, Mike Scott of Mike Scott Associates, lead an interactive, lively and fun session, whilst also allowing members and guests tap into Growth accelerator funding. Our usual structured, welcoming and productive lunch time format, then was topped off with an enlightening after lunch talk from Deputy Head Gavin Allmand of Abbey Gate College. Our next event is going to be the first where we bring together members and guests of both the Chester and Warrington group - so why not join us? Junes event saw us celebrate the start of our 4th, and we rewarded those founder members who are still choosing to network with us! Our Seminar presenters, Check Group, took us on a technical whirlwind, helping members and guest appreciate the revolution we have seen in technology to support communication, and share insights into what it means to communicate in the cloud! With almost 80 seated for our event, we then had a wonderful diversity of Businesses that listened, shared, and helped each other with their stories, experience and insights into Business and organisational life! To join us for our July 11th event - and see why we still attract successful businesses after 4 years - come along and join us! May was a peach of an event! Bless you for a brilliant lunch today. Everyone seemed to be saying what a great event it was. You guys work hard to make the magic happen just know, we all sooooo appreciate it! I just wanted to say thank you so much for a great lunch today. There were so many people to speak to from a construction and environmental consultant point of view that I didn't know where to start - Thank you - I'm busy arranging my 121's now. Thanks for a great meeting today. I met some really great people and have some fab chats. Thats what we are all about - so why not join us for our June 19th event at The Chester Grosvenor and Spa... It will be a great one! April brings along a sense of Spring at last! We love our members! Our seminar this month was in support of The Lord Lieutenant David Briggs Skill Share initiative. Joanne and David presented the ethos and aims of the scheme and some stunning examples of local Businesses supporting local Local charities and organisations. Skill share had identified that they had significant needs for websites and SEo as well as PR and marketing. And guess what? Our members made significant offers to help. Here is what Joanne said after the event... and all thanks to our great members! "Just wanted to say a big thank you for yesterday. It was an excellent environment in which to deliver the SkillShare talk and meet lots of great contacts, thanks for being so accommodating!" So why not join us next time on 16th May at the Double Tree by Hilton? March event - a heady mix of ideas, testimonials and brilliant connections! Diversity, passion and magical connections made our March event a classic! From the moment Maja Kenney kicked off our seminar we knew we were in for a splendid event. From Roof truss companies to wine merchants, delightful and ethical interior designers to marvellous bugs from Chester Zoo we had a heady mix of visitors and of course our exceptional members. With connections and opportunities aplenty it was a real treat to see such enthusiasm, connection and opportunity in the room. We are off to the Chester Grosvenor and Spa for April with The Lord Lieutenant David Briggs hosting the seminar - so book early to secure your place! We enjoyed a great event with our members and guests once more at The Chester Grosvenor and Spa. With over 90 Businesses in attendance we were in for another successful event. Andy Wooles of WSi shared his knowledge of Linked in to help members connect virtually as well as in person. Then with many testimonials and ideas sharing, connections and support we celebrated Valentines day in style. Until March 13th.... at The Double Tree by Hilton with Maja Kenney from Black Iris Exhibitions in place hosting our seminar - one not to be missed! Happy New Year - our event kicks off the year in style! With an enlightening and popular seminar lead by John Loney of Oliver and Co, all about Succession Planning, followed by lunch time networking for all, our January event got the year off to a great start. There were so many testimonials and thanks to share, and some amazing stories of generosity and support for our Charities and community projects. And guess what? Those Businesses who share their expertise and knowledge for these charities and community start ups are winning more business as a result of their philosophy for business - give to gain! So, if its time that you started to network in a giving and rewarding way, why not come and join us for our February 14th event? We will be acting as Cupids for Business for our members at The Chester Grosvenor and Spa. Go on - you have nothing to lose, and so much to gain! December's event raises the roof! From mini ipads from Check Communications, to Spa Treats from Be your own guru, to a Boiler Power flush from Woodhouse Ltd, we have a diverse and fabulous set of raffle prizes so kindly donated for our Chrsitmas raffle. We raised a staggering �1100 for our member charities - showing the commitment and generosity of our wonderful members. May we wish you all a merry Christmas and a healthy and happy new year! November - opportunities a Knocking! Great group meet to network, collaborate and give back to local community! The energy and passion of the Chester Business community is boundless! After a thought provoking and educational seminar lead by Heather Hobden of Icon Business Solutions - including real examples of techniques that help Businesses grow with vigour, we had an exceptional networking lunch. The synergies at tables was electric and there is just so much good work being done - supporting local ventures like Bridge Community Farms - testimonials to share, and a real sense of belonging, team work and commitment to each other. In December we have some Christmas treats in store - and are looking forward to raising lots of much needed funds for our charitable members. So why not join us for festive frolics, quality business connections and a kick start to Christmas! Octobers event - Opportunities galore! Great people, great company and great mix of Businesses. The October event was a busy one! From award winning announcements for Blue Leaf (Digital Agency of the Year) and Black Iris Exhibitions (Theo Paphetis small business sunday winner) to a inspiring seminar from Kate Fox and John Cooper from The Ikon Partnership, the event was jam packed! Excellent networking and to top it off a reminded or our most important and precious resource - time and how to best use it - rather than lose it, from Heather Hodben of Icon Business Solutions. Next month we are back at The Chester Grosvenor and Spa - where Heather Hobden will share her 4 secrets of success - to book head to our book events page. Property, Planning and Prudence and a great room of Businesses! Collaboration at its best this month when 3 of our members came together to share their knowledge on property. The Architect, Andy Foster of Andy Foster Architects, Planner Mike Gibson of Connectivity Associates and Financial Guru Edward Greeves of Morris and Co all shared their insights with the seminar attendees. We then had a delightful lunch with lots of interesting visitors with diverse and interesting Businesses, all ready and willing to share, learn, connect and collaborate .... Networking The Business Network Style! We are back to The Double Tree for our October 17th event and we hope you can join us there. Never mind the weather - The Networking was great! Nunsmere Hall Hotel hosted our Aug 2012 event - and the sun shone! Summer arrived and lifted the spirits of our members and guests as they enjoyed their networking in the sunshine and beautiful gardens of the Hotel. Andy Wooles lead a great seminar on how to manage the rivers of infrmation in todays ever noisy world. We then had a jam packed marquee full of diverse and interesting Businesses, all ready and willing to share, learn, connect and collaborate .... Networking The Business network Style! We are off to The Double Tree by Hilton on 20th September - so book early! Nunsmere Hall Hotel hosted our July 2012 event in style! Summer may not yet have arrived but the spirits of our members and guests were not dampened. Julie Webb from Azzure Marketing lead a great seminar on the importance of marketing effectively in todays ever noisy world. We then had a jam packed marquee full of diverse and interesting Businesses, all ready and willing to share, learn, connect and collaborate .... Networking The Business network Style! We are off to Nunsmere again on August 8th - fingers crossed for Sunshine so we can enjoy its fabulous grounds! Birthday event goes with a bang! Great Happy Birthday to us now we are 2! With many founder members renewing for a 3rd year, there was much to celebrate at The Business Network Chester 2nd Birthday event. A sell out seminar lead by Olivia Stefanino and Adrian Lomas of Blue Leaf kicked off the day in style. As usual The Grosvenor looked after almost 100 guests in fantastic style and we enjoyed great networking, lots of collaboration and great energy and vibrancy in the room! Springing into April with a leap! An Amazing April Event was enjoyed by all at The Double Tree by Hilton. Ideas, collaborations, business exchanged and lots of learning for our seminar attendees, courtesy of our Seminar Presenter Julia Worthington of Amber Consulting, and Elaine Cleland from Thomas Education. As we look to our May 17th event at The Chester Grosvenor and Spa we have Mark Murphy from NTTX hosting our seminar - lifting the fog about what "Cloud computing" can do for Business. So why not come along and join the best Business Network Group in the Chester and Cheshire area. March event was all about being flexible and Mobile! What a great event again at The Chester Grosvenor and Spa. We learnt all about the Mobile revolution from Andy Wooles and how it can help us improve our Business results. Connections, collaborations and a really exciting Buzz in the room - what more could you want from a Networking event? Next time we get to learn about how to implement CSR programmes that can add to the Bottom line and really deliver win win results for Business and Not for profit organisations. Why not just come along and see what the fuss is all about! Everyone has clearly realised its time to network! With almost 100 seated at our February event it was a packed lunch at The Chester Grosvenor and Spa. Lots of lovely connections to be made and some very special guest visitors made it a great start to 2012. No cobwebs on our members - lots of Business being done and connections being made. What makes us so good and head and shoulders above the rest? Come along and find out! Great event at The Double Tree by Hilton again! Fabulous January meeting with lots of great networking and Business being done. Many Thanks exchanged between members for good business referrals and connections - as well as some direct business being done - networking at its best! Next month we will welcome Aidan Manley, MD of the Cheshire and Warrington Local Enterprise Partnership - who will explain how we can all benefit and contribute to the development of business and investment in the area - one not to miss! Connecting, Collaborating and a Challenge too! Lord Lieutenant David Briggs joins us to talk about Skills Share. Great connections, good Business being doing and a groundswell of support for the Chester Voluntary Action SkillShare initiative. David Passionately spoke about the need to bring time and talent to the Charitable sector and the need for charities to accept that sometimes Business savvy thinking can help. Join us at The Grosvenor and Spa on 15th December and here from Phil Jones Sales and Marketing Director of Brother UK. Great event at the Double Tree by Hilton! Great energy in the room - and good Business being done. Members generously sharing knowledge and expertise... and some really exciting visitors joining us too! Back at The Double Tree by Hilton after a really long break.... too long! Lots of good connections made and the group has shown great support for Tracy and the Member charity Clatterbridge Cancer Research in donating funds towards the BIG event on the 29th October at The St. Georges Hall in Liverpool. Tracy does Samba for Clatterbridge.... Please donate - a few days of your favourite latte or tea and lets see if we can bust their �30k target! Fab event at The Grosvenor again! Great People, Great seminar, fab food and company - what more could we want with glorious weather too! Lots of lovely connections yesterday - the room was buzzing! Diversity and lost of interest after our Celebrate Cheshire foray meant we have yet again extended the reach and connections in the network. We also had the premiere of the video from Knew productions -more details to follow!!! Looking forward to our return to The Double Tree by Hilton 19th October - come and join our vibrant group! Chrissie Gibson of Connectivity Associates and Andy Wooles or WSI lead a combined seminar on the power of Linked in. Our Summer BBQ saw 2 Business Network groups combine and enjoy an evening of fun, frolics and challenges! In August we did things slightly differently - using our seminar time to bring members together to craft a way to exhibit at the Celebrate Cheshire showcase in September. Combining energy, passion and bags of enthusiasm we were able to create a compelling offer and very much hope we have enough ambitious members who will make this happen. Come and see us on Sept 16th and 17th at the Chester Racecourse and see us exhibit with Bentley, M&S money and Mornflake! We head back to The Chester Grosvenor and Spa on Wednesday 28th September so why not come and join us? Our first Birthday event at The Chester Grosvenor and Spa - wow what a buzz! With over 100 booked we knew our June Birthday event would go with a bang! Adrian Lomas, MD from Blueleaf provided a thought provoking seminar on how to improve your website - with the user in mind. Then with reception drinks and lots of magic at the table we had lots of super connections across the Room. "Its like a fine wine - it just gets better and better" Kate Fox, Creative Director of Fox Graphics. The lovely Richard Knew and Cameraman Kevin captured the event and comments from members..... news soon about the premiere! Want to see your yourself what the fuss is about? Then join us at Nunsmere Hall, Thursday 14th July or Wednesday 10th August. May event - outstanding success - again! We are on a roll! The energy and level of success at the meetings just keeps on getting better and better. As we approach our 1st birthday the May meeting demonstrated how engaged the Chester and Cheshire Business Community is in bucking the trend and staying positive and successful. There are now many collaborations, business ventures and lots of business being done within the group - which is all down to the high professionalism, passion and purpose of our members. Many great new visitors joined us again, eager to experience for themselves our very own style of networking. The Birthday promises to be a big turnout on June 30th at The Chester Grosvenor and Spa - and with almost 100 members now, its going to be exciting to see - who will be that 100th? Great event as we head to Easter! Fabulous event today. Great connections, collaborations and interesting members and guests. The business is really starting to flow.... something in the air? Yet again we saw over 80 Businesses in attendance at the Business Network Chester April event. Kate Fox, Creative Director of Fox graphics started off the day with almost 30 attendees who were curious to discover how image can make of break a Business. Then at lunch we saw many connections being made, and heard a 2 way story how the Business Network Chester has helped 3 Businesses collaborate to create a complete new offer. As we head to May we see the return to the Chester Grosvenor and Spa - so if you want to jon us and see what almost 100 of Chester and Cheshires Businesses have already discovered - come visit! See you on the 18th May! Oooooh - the tables were hot this month! Almost 80 of Chester's Businesses came together to enjoy a great network event. Lots of productive connections and the number of collaborations to create new solutions to old problems is very exciting! From large freight and packaging members, to unique retailers and swim schools we pride ourselves on being inclusive, diverse and welcoming. Our structured format is really striking a chord with the brilliant Businesses of Chester - when will you come visit and see what all the excitement is about? Next Meeting is at the Doubletree on 12th April - Thanks to the team there - they did a fabulous job today again! "Tracy, I really enjoyed the event and thought you were the perfect hostess. Quality People, Qaulity venue. We will look forward to joining you after Summer season!"